Game Outline: Your name is Silly. You are an alien trying to find a way to get back to your home planet Zooloo. Features: Full length talkie (speech & sound FX for all characters & animals) 52min Soundtrack (also available for download) Full walkthrough available! Windows installer, uninstall available, no spyware/adware Verified by download.com (Cnet) Bugs Fixed Slim version available 5mb (no music, sound & speech) Testimonials from the AGS forum: SHE DEVIL : "This is the GREATEST GAME EVER !!!" Kika : "I finished the game and liked it a lot. Silly is very funny." dcbert : "Finished game and I thought it was great! HATS OFF TO YOU." marlamoe : "I love this game. I am really enjoying it, but it is pretty difficult." dogberry : "I've completed it! What an excellent game well done!" 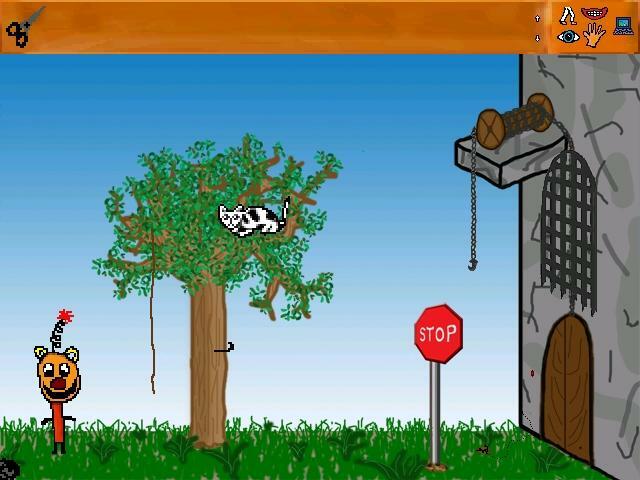 "A cute, fun game with fairly easy puzzles. However, it suffered from hotspot action points that turned into pixel hunts. Some of the Walk interactions needed to be under a different interaction mode. Also, the Talk mode was not included in the standard cursor modes. Also, it badly needs some random responses. Quite fun to play but would be better if improved as above. " Some of the puzzles were a bit random or illogical I felt. The game was mostly non-violent, but be aware there is a "battle" in it, although fantasy based. Also be aware that if you wanted a game that was friendly to all creatures, this game was close, but you do have to kill a few things. Really fun game to play on an afternoon. Although its a bit strange you should play this game.